This green coat has two snaps on each of its breast pockets and does up with a zipper. It also has a small pocket on the right sleeve. Sam first wears this jacket in Simon Said (2x05) for the duration of his time in Guthrie, Oklahoma (except for when he briefly wears a suit). In No Exit (2x06), Sam wears it at the end of the episode when they drive Jo and Ellen back to the Roadhouse. In The Usual Suspects (2x07), Sam wears it for the entire episode, only taking it off when he is in police custody, hacking into Tony Giles’ computer, and when talking to the detective in his hotel room. In Croatoan (2x09), Sam wears it for the entire episode, except for the scene at the very beginning when he wakes up from the vision to find himself on the floor of the motel room. In Hunted (2x10), Sam wears this jacket the entire episode, except he takes it off briefly in the motel room when he tries to explain to Ava about the psychic kids. In Playthings (2x11), Sam changes into this jacket for the goodbye scene at the end of the episode. In Houses of the Holy (2x13), Sam wears it for the entire episode, except the first scene he is in (wherein he wears white scrubs) and the final scene (when he and Dean are talking in the motel room). 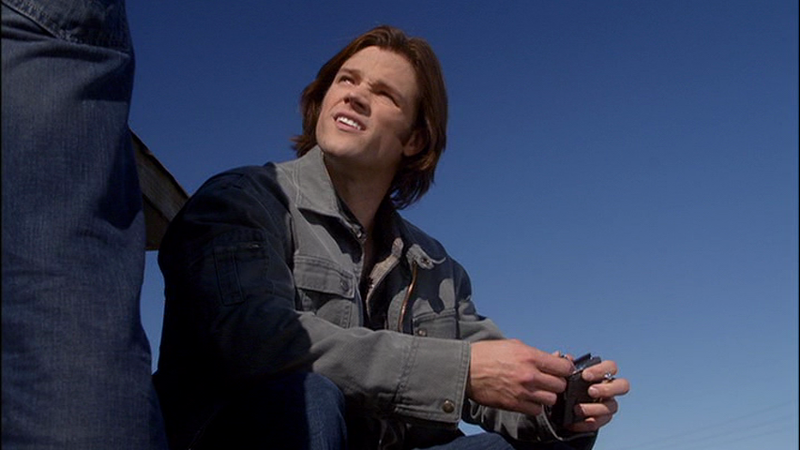 In Roadkill (2x16), Sam wears it in the flashbacks to when he is telling Dean about the highway and they are doing research. In All Hell Breaks Loose Part 2 (2x22), Sam is wearing it when he and Dean arrive at Bobby’s house. He keeps it on for the rest of the episode – only taking it off briefly while they are all researching at Bobby’s before heading to Wyoming to stop Jake. In Sin City (3x04), Sam is wearing it when they go to check out the bar for the first time. He keeps it on until the demons are dead – except when he takes it off briefly while he and Dean are eating at the bar, before splitting up to find Ritchie/trail Trotter - and then is jacketless for his final scene when he talks to Ruby. In A Very Supernatural Christmas (3x08), Sam wears it every time they go out (except when they are in suits, of course), and never in the motel room. The Pagan Gods also remove it while he is unconscious before tying him up. In Dream A Little Dream Of Me (3x10), Sam wears it at the end of the episode after he’s killed the dream-walker. In Jus In Bello (3x12), Sam wears it from the beginning of the episode until they leave the police station. In Monster Movie (4x05), Sam wears this jacket when he finally ditches the suit after investigating the Mummy attack. 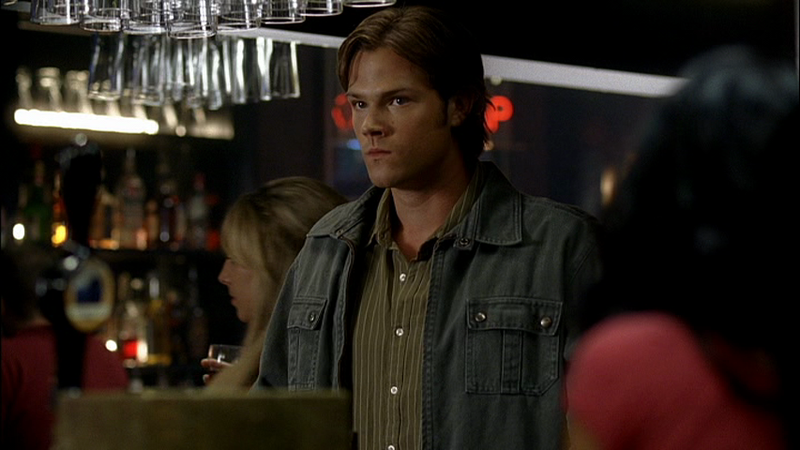 He shows up to meet up with Dean and “Mina” in the bar while wearing it, and keeps it on for the rest of the episode. In I Know What You Did Last Summer (4x09), Sam wears it at the end of the episode when he and Dean meet up with Ruby and Anna at the cabin. Sam wears it for the entirety of Heaven and Hell (4x10), except when researching in Bobby’s house after Anna’s hypnosis session with Pamela. 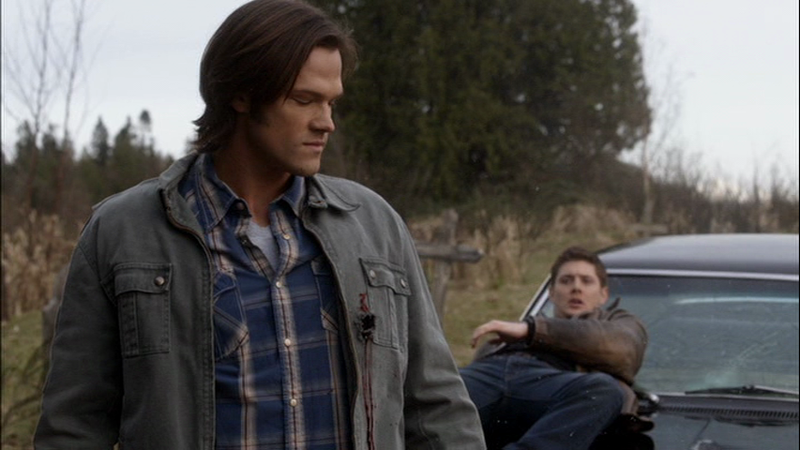 In Family Remains (4x11), Sam wears it in the final scene when Dean admits to enjoying his turn as torturer in Hell. In After School Special (4x13), Sam puts on this coat when he leaves the psychiatric hospital after interviewing the girl and joins Dean in the car. He see him in it again when they are burning Barry’s bones. He wears it until he and Dean have finished checking out the school bus, before they go see Dirk McGregor Senior – he only takes it off briefly during this time when he is recovering from being kicked in the nuts and stabbed. In Death Takes A Holiday (4x15), Sam wears it from the beginning of the episode until the attempted séance in the graveyard. Sam wears it for the entirety of the The End (5x04) – except of course when he’s Lucifer. In Changing Channels (5x08), Sam wears it when he is startled by the ghost during the opening theme song. In Dark Side of the Moon (5x16), Sam wears this coat inside Dean’s memory of when Dean was 4 years old. In Hammer of the Gods (5x19), Sam wears this coat for the entire episode. In Swan Song (5x22), Sam wears it for the entire episode. In All Dogs Go To Heaven (6x08), Sam wears this coat, whenever he is not in a suit, from the beginning of the episode until they shoot the Skinwalkers. He only takes it off when he is in the motel room talking to Lucky. In Like A Virgin (6x11), Sam wears this coat when he comes out of Bobby’s house to join Dean on the hunt, and when he and Dean are in the sewers hunting the dragons. In The Man Who Knew Too Much (6x22), both Soulless!Sam and Hell!Sam are wearing this jacket in Sam’s mind. In Meet The New Boss (7x01), Sam wears this jacket when they leave on their mission to bind Death and ask for his help. He isn’t wearing it when we next see him at Bobby’s, but then he puts it on again when they take Cas to back to Crowley’s lab in order to return the souls to purgatory. Sam is still wearing this coat as Hello, Cruel World (7x02) opens and Castiel disappears into the water. In The Mentalists (7x07), Sam wears this coat at the end of the episode when he and Dean chat in the cafe and then leave town. In The Slice Girls (7x13), Sam wears this shirt at the beginning of the episode as he and Dean travel to the job, and at the end of the episode when he goes to get information from Prof. Morrison, rescue Dean, and then leave town. these posts are really very cool!! I'm done with S1 coats now, and am moving on to dress shirts, plaid shirts, and hoodies. Exciting! I'll probably update with the first one late tonight. For season six you should call it the Evil Sam Jacket he wore that or the a Blue two pocket coat alot when he was running around souless. Indeed! I may call that Blue Jacket "Sam's Soulless Blue Jacket" or something, because that's a new acquisition that he made WITH NO SOUL! Also, he wore his Superhero Hoodie while he was Soulless (meaning that Dean must have left it at Bobby's, otherwise how did Sam have it? )...it just seems so wrong to have Soulless Sam in the Superhero Hoodie. I agree. Soulless Sam had no business wearing the Superhero Hoodie. I wonder if Sam will stop wearing the Green two snap since he used it to identify the soulless piece of his mind. The Hell-piece of his mind was wearing it too. The reason they were wearing it is because they were both wearing the same outfit that Sam was wearing when he jumped into the cage. So I don't know. He's been wearing it since S2, so I doubt he'll stop now. Gah, this jacket kills me. He wears it all the time, and yet we don't know who makes it. Makes collecting the clothes tough:)I wish we could just email the wardrobe department. Oh man, yeah, I'm supposed to be tracking down the brands of Sam's clothes, but I've kind of gotten side-tracked and haven't embarked on that mission yet. I doubt I'd be able to find it though, if it's not already known somewhere else. Does anybody know where I can either find this jacket or one very similar to it? >.> <. I'm waiting for this jacket to make a comeback tbh.